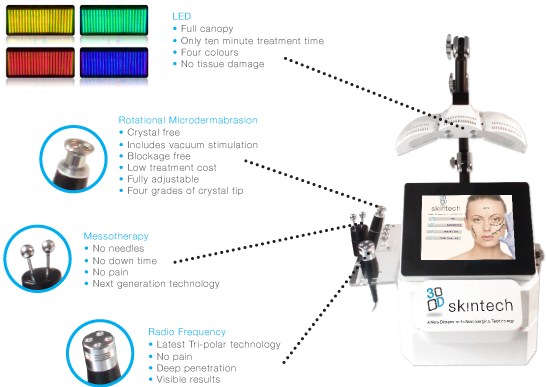 3D-skintech is a revolution in the non-surgical aesthetic skincare market. What is unique about the concept is that latest clinical technologies are combined with scientific cosmeceutical skin care line and peels to ensure that we can offer the most effective treatments for anti-ageing, pigmentation and acne. We can adapt different levels of treatment depending on whether we are treating under preventative protocols right up to the most curative applications. At Vanity, your trained Aesthetician will be able to prescribe you an exacting facial to suit your specific needs. With an array of result driven technologies and skincare to hand, you will be assured there is no better alternative. This latest technology combines the latest in adjustable, rotational control with variable vacuum to ensure a precise yet comfortable service. Microdermabrasion helps encourage skin cell renewal, reduces pores and congestion and improves fine lines. The rotating tip of the hand piece exfoliates the top layers of dead skin cells while the gentle vacuum brings blood to the surface and helps stimulate cell growth. Microdermabrasion can be used as a stand-alone treatment or as part of our combination treatments. Non-invasive mesotherapy ensures that the active ingredients are delivered where they are needed most without the need for needles. The concentration of collagen fibres and the regeneration of the collagen and elastin deposits tighten the skin layers creating a smoother, healthier and younger looking skin. A variety of different lights, which can be personalised to your individual needs. Helps with: Acne, pigmentation, regeneration of cells, ageing & dehydrated skin and inflamed skin. TherapyBlue light (470nm) for acne skin. Increases skin hydration and kills bacteria.